I was a little bummed out to find out that Ralph hadn’t managed to make enough Sequel nibs to save me one, but he promised he’d get me one after going back home. It was so great socializing with all of our fountain pen friends. I can hardly believe that it had only been a year since the last DC pen show, because so much had changed. We actually attended the show on Saturday. Surprisingly, the show opened nearly an hour early. As soon as we paid the entrance fee, I made a beeline for the 18111 table. Mr. Nakama and I had discussed my commissioning a fully custom pen from him over Instagram, and agreed to discuss it in depth at the show. I was eager to get my custom pen started. A little too eager, perhaps, because Mr. Nakama hadn’t finished setting up and requested I come back a little later. Not wanting to make a nuisance of myself, I spent some time walking around and chatting with people. 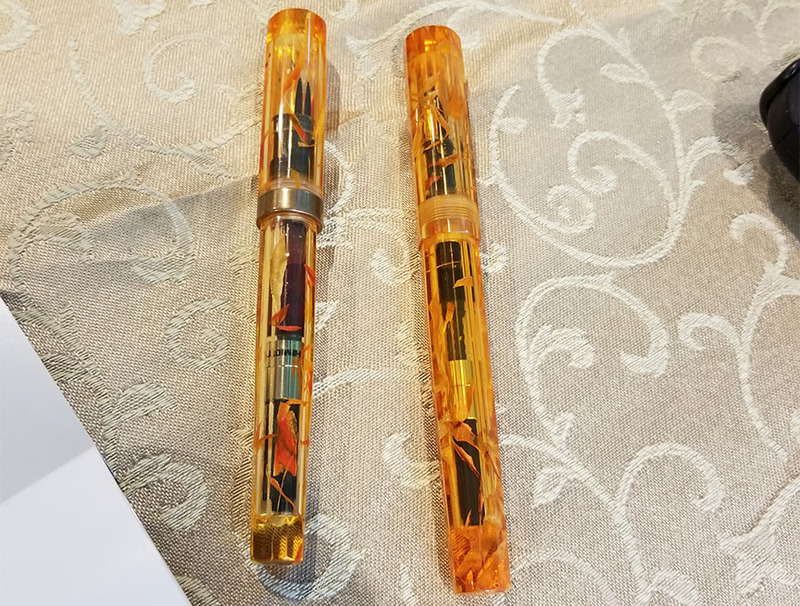 I made a short pit stop at the Herbert Pen Company table to chat with Chet, and was pleasantly surprised to see my previous Goldfish Ribbon pen repaired and in the demo case. So I staged a quick family reunion. My original Goldfish pen on the left, the new one on the right. It was great to actually know people this time. I got to see more friends I hadn’t seen since Baltimore in March. I stopped by the Bertram’s Inkwell table to say hello to Bert and Adam. I was pleasantly surprised to hear that the new nib for my Stipula Etruria Prisma 88 Magma had finally arrived. It only took two and a half months (good job Yafa). Expect a review comparing it to the Rainbow Prisma 88 sometime in the near-ish future. While in the large ballroom, I made sure to stop by the Franklin-Christoph table to pick up some more of my favorite notebook: the Franklin-Christoph Firma-Flex A5 Medium Journal Notebook in dot grid. I was able to pick up two of them at a great discount. When I stopped back by the 18111 table, Mr. Nakama was fully set up and willing to talk to me. My excited bubble deflated a bit during the conversation. The designs I want have too many sharp corners. We’re going to work together to try to come to a workable compromise. I’m hoping we can work something out, because I’d love a custom pen from him. 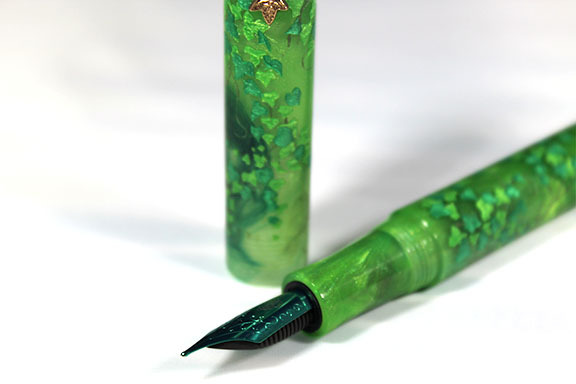 Since there isn’t a guarantee that I’ll get a custom pen, I spent a few minutes debating between two pens and purchased this gorgeous Green Ivy pen. TeAntae called me over to check out the colored nibs she’d discovered at the Hinze Pen Company table, and I had to pick up a green nib to go with the Ivy pen. Later in the evening, I heard from several people that colored nibs available from other people lose their plating very quickly, so I’m hoping these are different. I’d hate to find out I wasted my money. First pen purchases made, I headed back over to the main room and walked around for a bit. I was on the lookout for Ralph to have him adjust Jim’s Semiflex nib to make it more flexible. I came across Jim at the Pay It Forward (PIF) table, and we decided to head out for lunch. Once back, I finished my circuit of the large room, then headed over to Ralph’s half of the Herbert Pen Company table. While there, I showed him my Leonardo da Vinci, since he’d commented on it on Instagram. According to him, I’ve now given him a new grail pen. He did a great job adjusting the Semiflex nib. Jim was so happy with it, he reclaimed it from me as soon as he had a new pen to put it in. Good thing I’d brought a back-up nib for my pen, just in case. Ralph also surprised me with a finished Sequel nib, which I promptly purchased. With a new nib, over half of my pen show budget still available, and no real interest in anything I’d seen in the large room, I decided to get myself the other 18111 pen I’d been eyeing that morning. I’m pretty sure I surprised Mr. Nakama when I went back to his table. 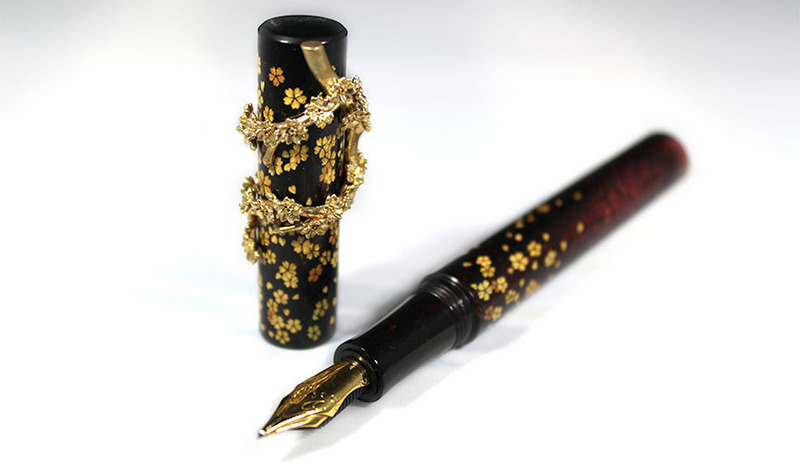 The Gold Sakura With Sakura Branch Roll-Stopper called to me as much the second time as it did the first, and I did my best to ignore the calls from the other gorgeous pens as he fitted the nib. That basically finished out the show itself for me. I spent some time wandering until Ifound Jim, then we hung out at the bar with TeAntae and Louise until it was time to head out to dinner. This was when Jim reclaimed his Semiflex nib, and I decided that the Sequel, which I’d originally planned to put on my custom 18111 pen, would look great in my Gold Sakura. The DC Metro Pen Crew had a dinner meet-up at Elephant Jumps, a really yummy Thai restaurant. It was great melding pen conversation and good food. After dinner, we all went back to the hotel andhung out at the bar. I showed Ralph his Sequel in my 18111 and took great joy in watching him freaking out over it. It’s been a while since I heard that much cursing coming out of a happy person. He also very much enjoyed seeing his Semiflex in Jim’s new Carolina Pen Company pen, as well. Eventually, despite how much fun we were having, we hit the metaphorical wall and headed home. Sunday was much more relaxed. We didn’t arrive well before the show started, instead having a more liesurely morning. Once we arrived, I spent some time taking selfies with everyone I’d purchased something from. I made sure to purchase a Pen World subscription, picking up the last issue in the process. 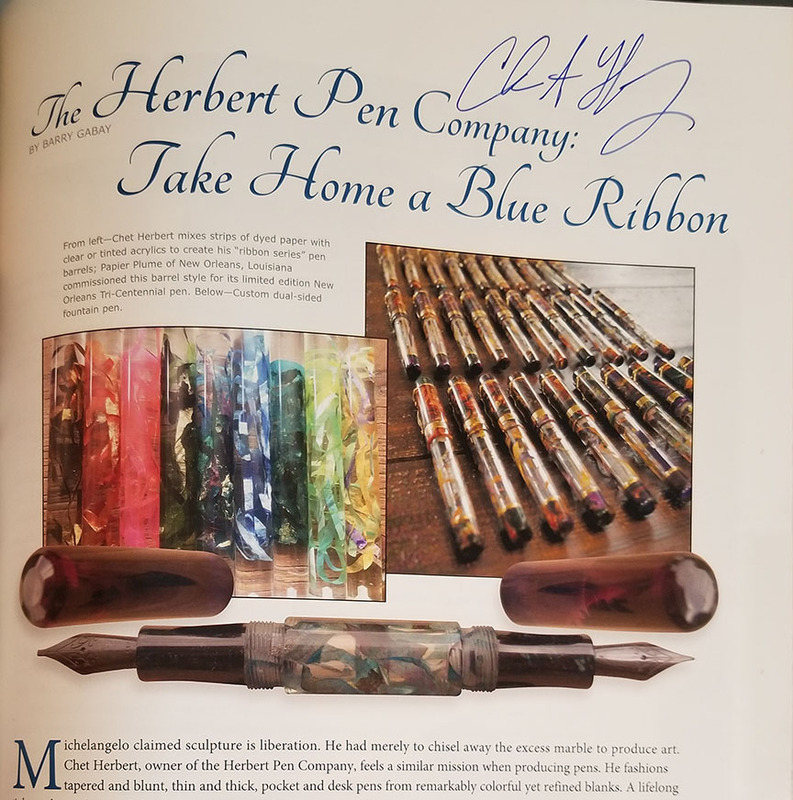 I took it to the Herbert Pen Company table to get Chet’s autograph on his article. I wanted to get Mr. Nakama’s autograph as well, but the lovely ladies of Pen World only had back issues to December 2017, and 18111 was featured in the October 2017 issue. Budget well and truly blown, I made my way to the PIF table to volunteer for a bit. I love volunteering at the PIF table. It’s fun to talk to the various fountain pen enthusiasts and newbies. Just after I arrived, Angela came by, and I picked up some adorable stickers from her. 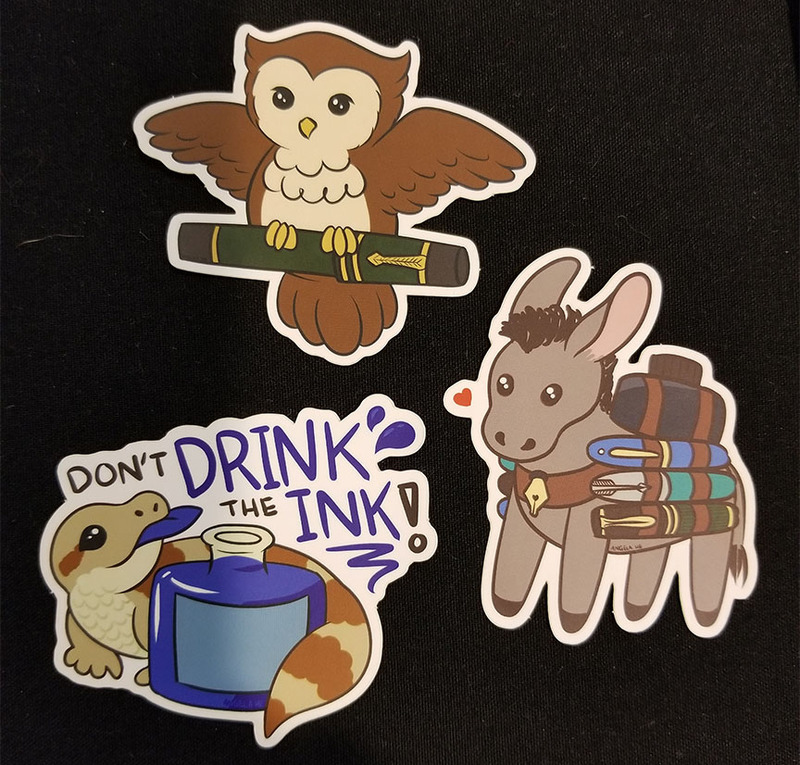 They’ll be going on my ink notebook. Unfortunately, at this show, we had problems with people taking advantage of the concept. I was told to keep an eye out for a woman who had essentially shovelled inks into her bag the day before, and had stopped by the table multiple times to take the best items. She showed up again while I was at the table, and I discovered that simply engaging her and her friends in conversation as they were arriving got her to leave the table without taking anything. I also had a man come by a couple of times taking the better pens available at each visit. I was left unsure what to say and how to feel. On one hand, he made a donation each time he came by. On the other, hew was essentially using the PIF table to bargain shop, and it was a rather douch-ey thing to do. I’m not typically a vindictive person, but I can only hope that Karma catches up with them. With my time at the PIF table done, we made a final circuit of the show to say bye to everyone, and went home happy and satisfied, but exhausted. I’m really looking forward to the Baltimore show next year, and we’re planning to go to the LA show as well. I don’t know how much more my pen collection will grow, as I’m learning what I truly like, and making purchases based on that rather than impulse buys, but pen shows are fun regardless. Great write up Rachel! Was so nice to see you guys and get to catch up! Thanks! It was great seeing you, too. That Sakura pen is gorgeous! Look forward to seeing it in person, not to mention its fabulous owner and her fabulous husband.